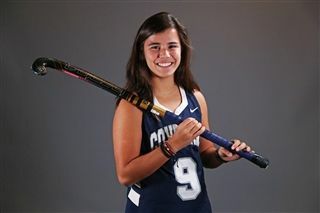 Senior Ivy Allen was named the 2018 Central Virginia Field Hockey Player of the Year. Field Hockey Coach, Alan Good, was also named the 2018 Central Virginia Coach of the Year. Ivy Allen has been a staple of the Field Hockey program at The Covenant School these last few years, consistently scoring and dishing out assists during her career. This year she scored seven goals and had six assists - but that doesn't paint the whole picture. Her hard work and consistent play helped the Eagles advance to the State Semifinals and she was named to All-Conference and All-State teams. Every year she has been on the team, the Eagles have reached at least the State Semifinals. She will continue her Field Hockey career at Miami (Ohio) in the Fall. Helping Ivy and her teammates to be successful this season as Head Coach was Alan Good. In his first season at the helm for the Eagles, he brought a wealth of experience to the program as well as consistency - he had previously served as an assistant under former Head Coach Annie Gumbs. Gumbs is still involved with the team and provided a great foundation for Good as he led the team to a 14-1 finish on the season. The Eagles did not concede a goal in the regular season and were versatile on offense, a testament to their coaches. Good was also named the Blue Ridge Conference Coach of the Year. Read more in this announcement in the Daily Progress.